200m Wireless Doorbell kit with Brass Bell Push on Black Perspex Plinth, Model D911PBB76. Contemporary styled brass push on a Black Perspex plinth. A high quality wireless doorbell linked to a contemporary styled wireless brass bell push on a black perspex plinth. Friedland, Door Bells. Bell push fixings included. Colour - Silver with silver / black bell push. Batteries - Bell push, 1 x CR2032 Lithium coin cell battery supplied. Battery included with push. This is a less crowded frequency, which reduces interference. Friedland, Door Bells. This is a less crowded frequency, which reduces interference. Download Instructions. Bell push fixings included brackets, Rawl plugs, screws and sticky pads. Colour - Silver with white Honeywell bell push. Contemporary styled brass push on a white Perspex plinth. 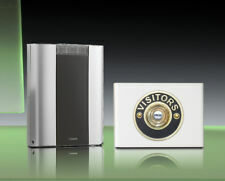 A high quality wireless doorbell linked to a contemporary styled wireless brass bell push on a white perspex plinth. The system has a long 200m distance and operates at a frequency in the 868MHz range which is a less crowded, and avoids any problems with interference. 200m Wireless Doorbell kit with Black Bell Push on White Perspex Plinth, Model D911WPWMB. Contemporary styled black push on a white Perspex plinth. A high quality wireless doorbell linked to a contemporary styled wireless black bell push on a white perspex plinth. MODEL D253WE. FULLY PORTABLE. RADIO SIGNAL. NO WIRES. The system has a 100m distance and operates at a frequency in the 868MHz range which is less crowded, and avoids any problems with interference. Download Instructions. Period Style Wireless Doorbell. The system has a long 200m distance and operates at a frequency in the 868MHz range which is a less crowded, and avoids any problems with interference. Download Instructions. Period Style Wireless Doorbell. 2 Year Warranty. Bell Push battery 1 x CR2032 included. Contemporary styled brass push on a black Perspex plinth. A high quality wireless doorbell linked to a contemporary styled wireless brass bell push on a black perspex plinth. The system has a long 200m distance and operates at a frequency in the 868MHz range which is a less crowded, and avoids any problems with interference. Friedland, Door Bells. Compatable with all Decor and Evo and Evo products. 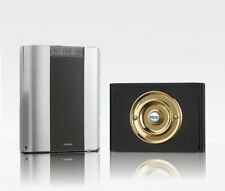 Modern design with 25 pre-recorded quality sounds, both traditional and contemporary. Download Instructions. White Bell Push, 1xCR2032 battery cell supplied with bell push - typical life 3 years. White Bell Push, 1xCR2032 battery cell supplied with bell push - typical life 3 years ?. Sound Level 80dB at 1m ?. Compatable with all Decor and Evo and Evo products. Strobe option. 6 programmable tunes and 3 alert options. Portable or wall mounted. The push button is missing. Outer box is slightly tatty. Item Details Data & Sizing Other Information. 3 Tunes, Westminster, Ding Dong and Ding. 16 House code channel options. Honeywell EVO D3003S White Wireless Doorbell. Wireless gongset with 150 m range. Up to 6 different buttons on a radio gong. We also accept credit and debit cards. Epicentre Sales operate from our own 20,000 sq ft warehouse in the East Midlands of the United Kingdom. USED - SUPPLIED AS PHOTOGRAPHED. Electrical wholesale supplies and specialist components. NORTHERN ELECTRICAL WHOLESALE. This is a less crowded frequency, which reduces interference. The push can be used as a landscape push or used as a wired to wireless converter. As a converter it can connect to existing wired system - to extend a wired system, or connect to a wired bell push. Byron SX-220W Wirefree Rechargeable Door Chime and Push 100m Range Top quality wirefree chime and push from market leaders Byron...... with a twist. 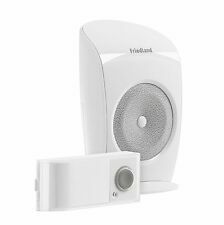 This is a wirefree doorbell which is fully portable, but never needs batteries as it has a mains powered charging unit which you can sit the chime on to recharge, and then either leave it in place (looks pretty cool) or move it to wherever you need it to be! ---Rechargeable and portable, contemporary design ---Chime unit can be left on charger or used as a portable chime ---Mains charger dock 240v UK 3 Pin Plug, plug in power supply included ---8 CD Quality Selectable Chimes ---100 Metre Range between push and Chime ---Easy installation, completely wire free, fixings included ---Dimensions - Door Chime 85mm Diameter ---Dimensions - Bell Push 16 x 29 x 80mm. Friedland, Door Bells. Download Instructions. Push button 200m wireless range with portrait push button design. Bell push Fixings Brackets / Screws / Sticky Pads. Batteries - Bell push, 1 x CR2032 (supplied) - typical life 2 years. C to 30?. C to 40?. Friedland, Door Bells. Bell Push Buttons. About XtrasOnline. Useful Links. Wired to Wirefree Extenders. Contemporary Style Door Bells. Wired Tubular Door Bells. Period Style Door Bells. Friedland, Door Bells. This is a less crowded frequency, which reduces interference. 200m range. (with 2mm gap). Catch Battery: 1 x CR2032. Bell Push Buttons. Wall mounting fixings included. Wireless - Other. Friedland, Door Bells. This is a less crowded frequency, which reduces interference. Download Instructions. Bell Push Buttons. Wireless - Other. Clock Work Door Bells - Windup. Byron, Door Bells. Jacob Jensen, Door Bells. This is a less crowded frequency, which reduces interference. C to 30?. C to 40?. Period Style Wireless Doorbell. Bell push fixings included. Batteries - Bell push, 1 x CR2032 Lithium coin cell battery supplied. Battery included with push. This is a less crowded frequency, which reduces interference. Friedland, Door Bells. Period Style Wireless Doorbell. Bell push fixings included. Colour - Silver with silver / black bell push. Batteries - Bell push, 1 x CR2032 Lithium coin cell battery supplied. Battery included with push.